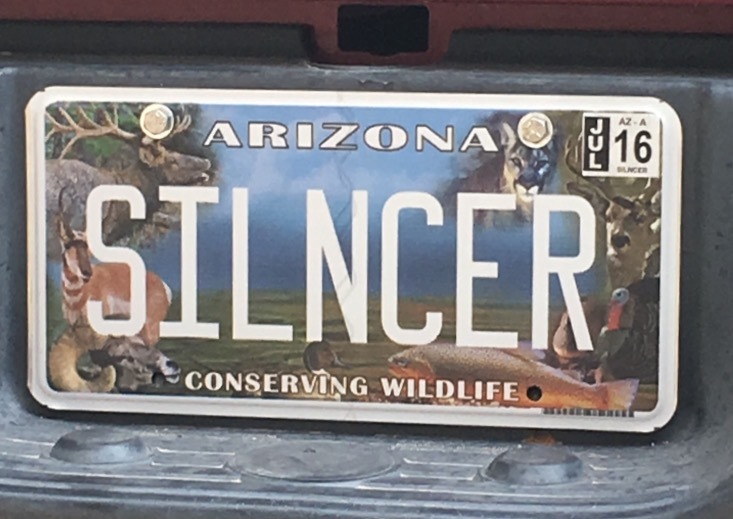 creed, if you and your wife want to see if shooting with silencer might help, let me know. I am just south of Sierra Vista. I will probably be up in Tucson sometime this week. Bears are here about two weeks a year from the end of August to mid September, only when the apples up the Canyon are ripe. Every year after their apple snack they break into my chicken coop and kill... until last year when I electrified my chicken area. Just a swag, 95% of the illegal garbage that used to be left in 35A east of the Huachucas stopped once our section of the wall went up. Much of the old trash is still here but it’s fairly rare to see fresh illegal left-behinds. What can do you have or do you intend to get? I don’t have a T3X Lite, but have seen a few a cans mounted on skinny barrels. What caliber is your rifle and what is the muzzle diameter? If you would consider cutting the barrel back a bit, what is the diameter at an acceptable barrel length? Good stuff. While going after feral cats, I’ve live-trapped and released 10 or so opossums over the past few years on the east side of the Huachucas just south of Sierra Vista. They all appeared to me to be the same common Virginia opossum (Didelphis virginiana) that I grew up with in Missouri and Indiana. We used to catch them in live traps and mark them with paint to see if the same critters came back each night. I remember being surprised that we rarely caught a marked individual even with catching an opossum almost every summer night. Just about the only nights we didn’t get an opossum, we trapped a skunk. All fun for a youngin. I’ll look for some pics of my recent trapped opossums. Almost but not quite an SBR. No wait, no $200 tax. You cant put a vertical fore grip on a pistol so its a nice setup while you wait for your Form 1 approval. Most 35a bucks have shed with nubs of new growth visible, but I saw a one-sided antler boy a few days ago. If anyone wants to bring their rifle down and screw on a can or two for comparison, let me know. Or better, if a few people want to come down to demo some cans, lets do it. Maybe hear a TBAC Ultra 5, Ultra 9, SilencerCo Omega, Harvester or Hybrid in person so you can decide for yourself. There are a few places to meet off Hwy 90 not too far south from I-10. Of course, we have to wait until the fire restrictions are lifted. As of now, Coronado NF says no firearms until 31 July, or sooner, depending on when restrictions are lifted. Talk to the guards about where they are seeing elk. Depending on the hunt you have, and the hunt pressure the previous week, the elk can be anywhere and everywhere. rancilio replied to MT_Sourdough's topic in Turkeys! In 35A, we had gobblers gobbling and strutting in January, then not much in Feb or March, but the Toms were in separate flocks. Toms seem to be mixed with the hens now, but no gobbling or strutting.